Learn more about the Mastercool 52325 Thermal Imaging Camera with prices, key features, and frequently asked questions. 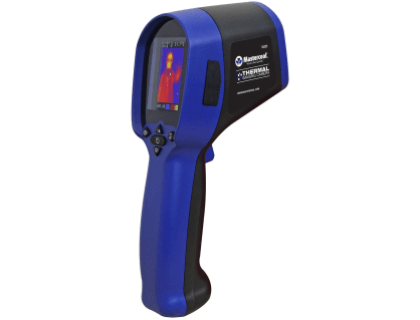 The Mastercool 52325 Thermal Imaging Camera is a handheld thermal camera that can detect heat automatically. The camera's LCD screen allows you to see hot and cold spots in a wall, heating system, or other physical structure. Pros: Accurate temperature reading. Automatic focus. SD card slot. Cons: Small display screen. Small view field. Bottomline: A moderately priced thermal camera with ample storage space and better battery life than most competing models. The Mastercool 52325 thermal camera costs $469.30. How long does the Mastercool 52325 battery last? The battery lasts for up to three hours of continuous use, but it can be recharged. How do I start viewing thermal images on the Mastercool 52325? Just turn the camera on and point it in the direction of whatever you would like to examine. The camera will automatically adjust to focus on the object and display a thermal reading for you. Can I use the Mastercool 52325 on a job site? Yes. The Mastercool 52325 has a rugged design and it small enough that it is very portable. Tradespeople and contractors use the camera to identify hot or cool areas in a building. Are there any Mastercool 52325 alternatives? Flir TG167 74701-0104 NIST Thermal Camera. Flir C2 Powerful & Compact Thermal Imaging System. Flir ONE Pro USB-C Thermal Imaging Camera. Flir E8 Point-and-Shoot Thermal Imaging Camera. Top 17 Best Thermal Imaging Cameras with pricing and FAQs.